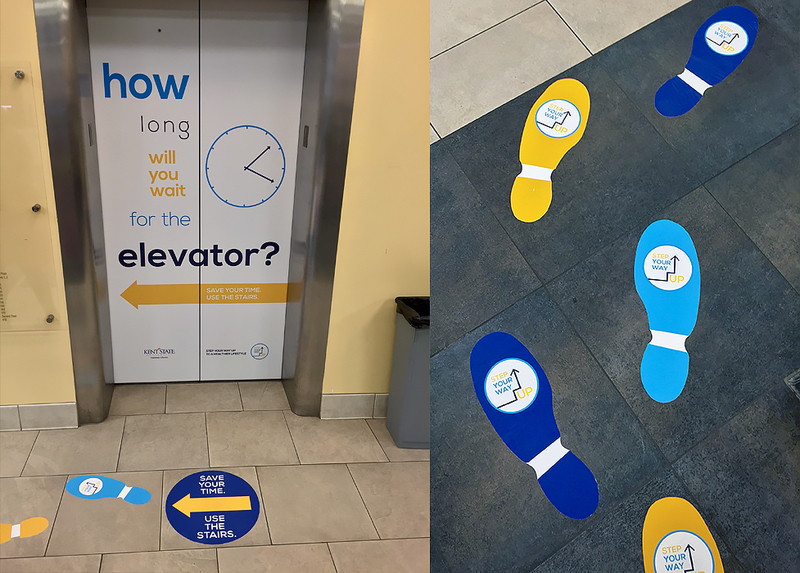 An initiative to improve the health of the Kent State University students, faculty and staff through physical activity - promoting stair use across campus! So, why take the stairs? Easily accessible, convenient, does not require a change of clothes, gym membership or time out of your schedule! It helps maintain weight reducing risk for obesity and chronic diseases. Improve bone and joint health. You might help save electricity. Going to the 4th floor? Help save electricity by taking the stairs today! Are you in the library for hours studying and have no time to break for a workout at the recreational center? Take a break and take the stairs to the 8th floor and back! The vision is to make KSU a healthier campus by creating awareness of one’s environment and using reminders to encourage positive health behaviors. Use creative decal graphics, photographs, encouraging quotes and posters, visual cues/prompts and colorful footprints on floors to lead people towards stairs in various buildings. Colleges and departments across campus can use the stairwell walls in the library to advertise, graphical decal designs – ‘Sponsor a Wall’. Promote ‘goal setting’ by encouraging the use of pedometers, fitbits and other physical activity tracking devices and apps. To develop a health app. unique to KSU that will allow for integration with other pedometer apps and tracking devices to motivate users to stay physically active. Want to sponsor a wall, or for more information please contact Lorriane A. Odhiambo.